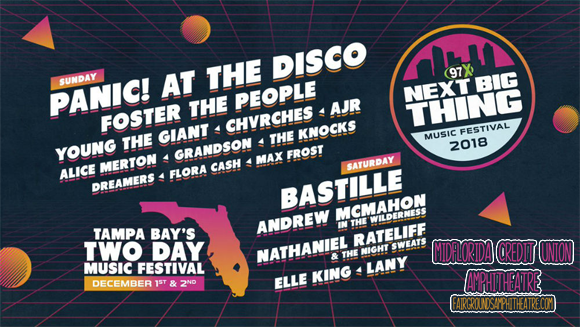 Tampa's hottest alternative music radio station, 97X, will be putting on its eighteenth Next Big Thing event this year, bringing together some of the biggest bands in alternative music for an incredible two-day-event! This year, the line-up is more exciting than ever, with Saturday boasting sets from Bastille, Andrew McMahon in the Wilderness, Elle King, Nathaniel Rateliff & The Night Sweats, LANY and more! Plus, there'll be music from the annual battle of the bands Live Competition Grand Prize winner, who will have earned their slot on the 97X stage! Ensuring the future of mainstream alternative music is bright and shiny, 97X will once again pull out all the stops to make sure the best music gets to the best people! Tampa Bay is known for throwing a rockin' party and this will be no different! Not only will there be amazing music and entertainment, but there are food stalls from a host of local artisan vendor to keep your stomach occupied as well as your ears! Make sure you head to MidFlorida Credit Union Amphitheatre on Saturday 1st December 2018! Get your 97X Next Big Thing – Saturday Admission ticket now!! !